moving to creative commons licences! As part of the process of opening up the DAAO to the structures and benefits that the internet has to offer, we are moving to Creative Commons Licensing system. From May 1 all text contributions will be licenced under Creative Common Licence. This is a small step that has big benefits. Its a small step because our existing Contributor and End-User Licence Agreements are already Creative Commons licences in spirit, in as much as our current licences allow others to use and share our content, so long as they attribute back to us and that our work is not used for commercial purposes. However, our licence does not say that anywhere near so clearly and many are confused by the legalese of the current licence. This is a problem if we want to collaborate with other institutions in sharing our data. We must have clear and easy to understand processes and human readable licences that embody the spirit of our project- and the spirit of our project is to enhance research and foster innovative collaborations around Australian Art and Design. Creative Commons is “a nonprofit organization that develops, supports, and stewards legal and technical infrastructure that maximizes digital creativity, sharing, and innovation.” http://creativecommons.org.au/ Creative Commons is part of of the ethos of openness and innovation in which the DAAO places itself- front and centre. There is, of course, also the legal code version http://creativecommons.org/licenses/by-nc-sa/3.0/legalcode. (Even this is well written and user friendly legal code). The big benefits? By moving to Creative Commons licences we move to a well-known, community supported, plain English system that is becoming the standard within e-research and the GLAM ( Galleries, Libraries, Archives and Museums sector). By being clear about what the rules of use of, and contribution to, our site are, we make it easier for other institutions, particularly museums and art galleries to inter-operate with us, and in so doing enable our content to reach larger cohort of researchers. It also facilitates new data sets being exposed to each other and that opens up the door to new research questions and new approaches to art and design research. I’ll finish this little post with a link to a talk that Mike Edson, Director, Web and New Media Strategy from the Smithsonian Institution, to explain and champion the value of the commons to research. http://www.slideshare.net/edsonm/m-4402558 (Thanks to Liz for sending me the link). For further questions on the changeover to Creative Commons, please read our FAQ document. Comments Off on moving to creative commons licences! the hard work of making things easy. Huge meeting last Thursday with DAAO core team (Jo, Olivia and me) and the House of Laudanum team ( Zina, Snow and Lotte (who skyped in from Amsterdam). Snow talking us through some of the ways we can automate data entry making the task less onerous and more accurate. We talked a lot about the contributor- that is the person who will write accurate quality biographies and enter accurate relevant data in the metadata fields. When we extend the schema- we are also asking people to enter in more data- to make a greater commitment to the DAAO. We have to make it worth their while. We can think of this extra value along two different paths: the satisfaction one gets at interacting with good design and seeing a change being made to a record in real-time; and the additional value one gets from being part of a community that is relevant and useful to you. In the image above, Snow is talking us through how a semi- automated data entry system could help ease the burden of data entry on the contributor. For instance, imagine if you could just cut and paste an exhibitions list into one field, rather than entering every exhibition into a single field? 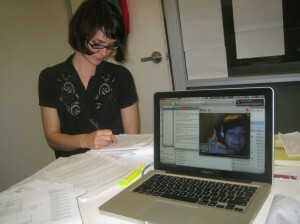 Too much data entry is placing a big obstacle to to contributing to the DAAO. However, each decision we make has consequences. If we allow cutting and pasting exhibitions into one field-how will that affect exhibition search results? Could we find a system that structures the data automatically? For instance, we are thinking about using Open Calais to help use semantically structure the biography text fields so that much of the metadata fields can be automatically populated from the biography text. Using semantic web technologies (which is important in terms of future proofing our site) also has implications for the structure of our database. Only one week back and Olivia is as focused as ever. Lotte on the lap top is holding up well, given that it is 10pm Amsterdam time. 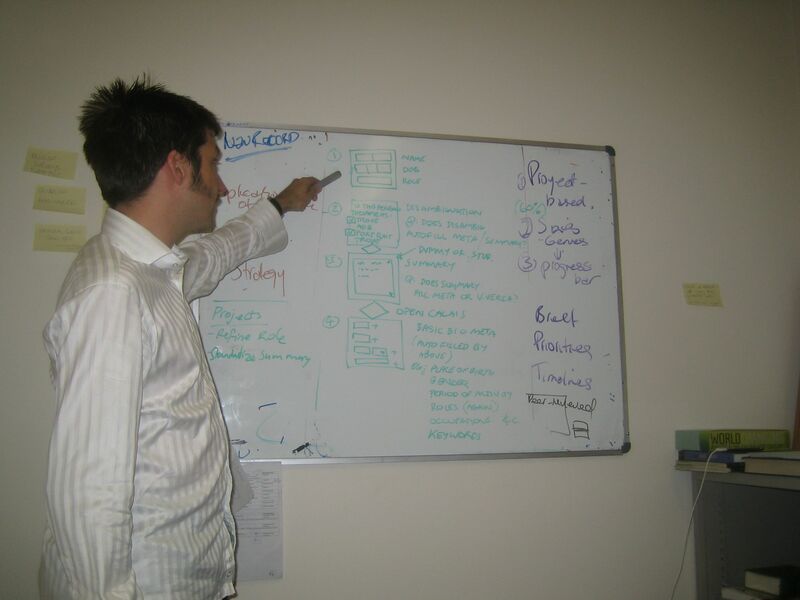 There are always compromises made in the design process- who we do focus on- the contributor ( the person who produces, checks and updates the content) or the user? Of course, ideally they would overlap considerably (think social media)- but our research shows that they are pretty disparate groups at the moment- which is why ‘community building’ is so pivotal in projects like this. At this stage, we need to think a lot about the experience of getting content onto the site as we need more content- and it needs to be authorative, up-to date and comprehensive. There is no user without a contributor. There is lots to do, but the DAAO is in many ways still in its infancy- we can plan for the future, by making priority lists. This process is sometimes called MoSCoW- Must-Should-Could-Want. Because we are developing the project in a modular fashion, we can assign some things as CANs and WANTS and develop them later and write new grants to develop them with different partners. For instance, it would be brilliant to have a ‘save search and annotate’ feature in this iteration of the DAAO, but can we afford it? Is it the most important thing now? or would we rather try and get images into the site? (User research says Images gets Must, Save search and annotate gets a Could). All of these features that we want go into the technical specification which we hand over to the Developer and we work with them to get as far down our priority list as we can without compromising the quality and functionality of the site. Comments Off on the hard work of making things easy. We have begun our User Experience design process. This is a very exciting stage of the project, where we really start getting a sense of the site will be like- how it will function and what it might look like. It is also the time when all the hard questions have to be asked and decisions are made. What kind of experience do we want our users to have? Who are they? What will make them want to not only use the DAAO but contribute to it. How will all different types of users and stakeholders get value from the DAAO? and then once we ‘think’ these solutions, we need to design them and make them practical and implementable for the site developer. We are very fortunate to have to have a such a great team of people working with us. I was particularly pleased to find out that House of Laudanum, (who are working with us also on User Experience design stage) had engaged Lotte Meijer to collaborate with them on the DAAO. Lotte is a very talented artist and Interaction Design specialist, who I first meet five years ago, when I was a visiting scholar in the Digital Design program at the Piet Zwart Institute, Rotterdam. Lotte had just completed her Masters in New Media and Digital Culture at the University of Amsterdam, and was doing amazing work on mobile interactive technologies and open-source publications. She has since gone on to work at MOMA and the Museum of Contemporay Art, Chicago, designing all manner of quality content, high interaction sites. 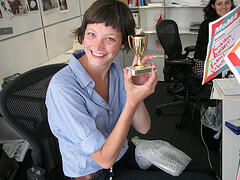 Did I mention she has also won a Webby? A Webby is often referred to as the Web version of an Oscar and Lotte was part of the Smart History Project that won the 2009 Webby in the EDUCATION section. Yep, that’s the kind of team of team we are building here at the DAAO. Already Lotte and Zina and Snow from House of Laudanum are coming up with some great ideas to generate not only ‘good experiences’ for our users, but are also really focussing on how we build our community of users- so that we can start having real hubs of research activity accumulating around the DAAO. Its very exciting, but it is also a long term project- we need to get the foundations right, so we can keep growing and developing in the future. One of the ‘users’ that we have really been focussing on is the ‘contributor’. What is the experience of either writing a new record or updating and correcting an existing record like? This is question that moves well beyond just thinking about the work flow rules of the site ( ie how a person can interact with the site) or the graphic design of the site, but moves alos into question fo motivation- why would anyone come, why would they stay? why would they contribute? Best practice in website production must take this kind of total systems approach and fortunately we have the skill set around us, the budget and an enormous amount of goodwill from pretty well everyone we deal with it. Everyone wants to help. I have to say, its the thing I love the most about working in digital cultures and online production- its a culture of sharing, collaboration and practical solutions. In other words, the design needs to find a solution not only for the data but also a solution for a existing and potential users and that entails knowing about the context of use at both a micro level (what happens when you actually hits the buttons and use the site) and a macro level (what is happening in online public scholarly activity, who is funding what? what are the emerging norms of practice, where is the technology going etc) But more about that in the next post! Many of you, particularly those of you on the Editorial Board and the Art- and Design Research Groups will have been receiving quite a few emails from Olivia and I this week; informing you of consultation processes and timelines; providing reports and asking for feedback, updates on how work is proceeding on the MREII grant. Others will have been talking to Zina Kaye, our consultant Business Analyst. I have now managed to have a lovely informative telephone conversation with everyone except two of our CIs who are currently overseas. Its been great to finally chat to everyone, it grounds the project back to its core business of research. I’ve been learning so much about Australian art history. I had no idea how little I knew. its wonderful to be on learning curve. A lot of the recent communication frenzy is due to the fact that the jewel in the DAAO crown, Olivia Bolton, is about to go on her first holiday in way too long and so we are both finalising matters requiring her core knowledge before she goes off for a wonderful relaxing email free month in France. It will calm down once Olivia goes at end September. The project is really gearing up. We now have a Data Manager, Jo Croucher, who will work with us for 2 days a week until Christmas. Jo is seconded to us from UNSW library is a very able and tech savvy librarian who is very proficient in metadata organisation. She has come on board just in time as she will be crucial to our process of metadata field extension and refinement. Over the next few weeks, you will find more activity happening on the Research Finding page as we start loading up summaries of your feedback to various tasks. By communicating to each other through google docs by way of questionnaires and forms, shared documents and then feeding them back into the blog, I am hoping to make the processes of our collaboration as transparent as possible. We also have the side benefit of generating documentation as we go. I have posted up a table on the Research Results page that shows how CIs have been organised into groups that provide different resources to the DAAO over the life of the grant. Comments Off on Floodgates open! This week Olivia and I have been focusing on the schema changes we need to implement in order to capture additional information on Exhibitions. 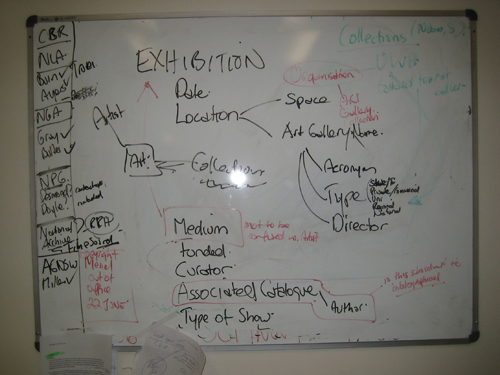 We have been analysing Jonathan Holmes’ wonderful Art@Base exhibitions database, which, as well as providing much needed content, has provided a very useful model for an expanded exhibitions field structure. We have also been using some initial User Scenarios (developed in my early scoping of the project) and actual CI research projects to develop benchmarks. We do this by mining your research proposals to elicit the series of queries that would satisfy the informational demands of your project. 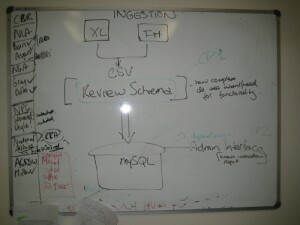 The diagram below represents the beginning of mapping such benchmarks. The project that we were scribbling about below has 6 major types of queries for the DAAO, i.e. 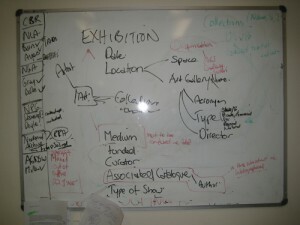 report relationship between curators and exhibitions, or report relationship between exhibitions with X heritage values. At the moment the DAAO can only respond to 3 of the 6 type queries and it could not display the relationships between variables in a comprehensible way. Thus at the end of the project, we would expect the DAAO to answer all six questions and display results in meaningful and variable ways. So the more information we get about your research proposals, the better we can design how the new data we are incorporating can be organised. We have also started thinking about the processes of ingestion as new high quality research data appear out of dark to find a new home in the DAAO. In order for data to be ingested, we have to match the tables of different databases. Simply put, we need to lay out all the tables side by side in an excel document, compare the field structures and their naming conventions and then co-ordinate and systematise a matching of their structures. The diagram below came out of discussion I had with David Turnbull (Manager, Web and Innovation, UNSW), where we were talking about the process of an an ingestion module and how it interacts with the critical path of our project. David is on our Technical Steering Committee, and he is one of many people around here that always has some time to explain and clarify technical issues. Another is the patient and sensible Laszlo Gercsov, UNSW Digital Library’s Systems Architect. We are very lucky to have such clever and helpful people around. The word of this week is LEGACY, which sounds ok until you match it with the word ISSUES. Another of the helpful clever people around here at UNSW is CSE’s Daniel Woo. I’ve known Daniel’s work for years, but he has just finished managing a database project, and his calm words had the hard edge of fresh experience behind them. LEGACY ISSUES, he said. Ah yes. Migration path. On the list for next week.